A horrific photo of a mother and baby elephant fleeing an angry mob in West Bengal, India, has won the top award in a wildlife photography competition. The hard-to-look-at image, taken by photographer Biplab Hazra, shows the two panicked pachyderms desperately trying to flee a large group of laughing men who are hurling flaming tar balls and firecrackers at the creatures. 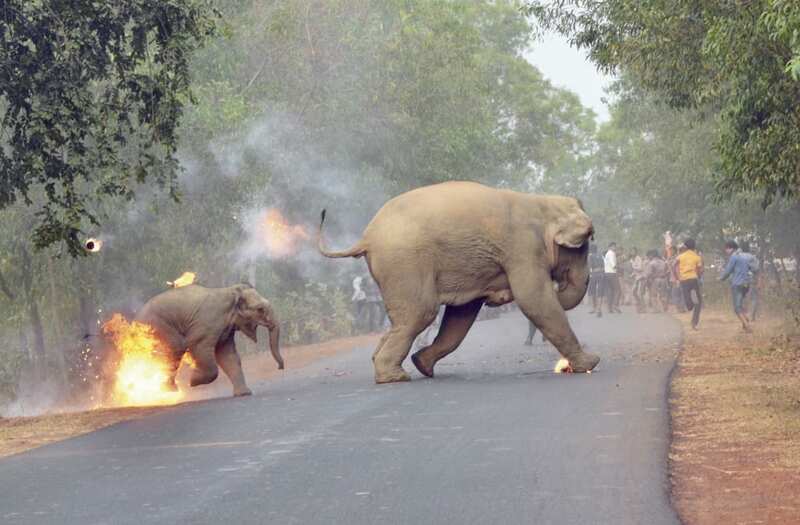 Hazra's photo captures the exact moment one of the flaming weapons makes contact with the baby elephant, lighting the helpless animal's hind legs on fire while it screams out in pain. Forsaken: Death is inevitable. A spotted deer struggles furiously and helplessly as a bask of crocodiles enter into a feeding frenzy. It turns its eyes heavenwards, but seconds later is ripped to shreds by the ravenous reptiles. The acute desperation evident in this image captured on the banks of the Buthawa tank in Yala National Park is enough to trigger one’s fight-or-flight response. The ill-fated deer was originally felled by just one crocodile, but the others were quick to join in. Last year, we compared Milinda Wattegedara’s equally well-timed special mention image to a Monet painting, this year it’s reminiscent of a twisted, jungle-themed Botticelli. With his steady hand, he has framed a staggering, action-packed image that depicts the gory, no rules apply rule of Mother Nature. Valparai Vagrant: Are our closest cousins getting too close for comfort? At a pitstop on the drive up to Valparai in the Anamalai Hills, Sitara A. Karthikeyan observed a bonnet macaque perched on the tyre of a tourist vehicle. As various states in India lobby to cull or sterilise monkey populations, and grapple inefficiently with chronic monkey-human conflict, the simians continue to adapt as best as they can to live alongside their human neighbours. Unfortunately, root problems – shrinking wild habitats, an abysmal lack of waste management systems and the annoying penchant that tourists have for feeding monkeys – remain ignored. The soft tones of this image, the monkey’s pronounced bonnet and its disconcertingly expressive eyes call for a moment of introspection and the realisation that this is yet another species that’s trying to survive the age of the Anthropocene. Between a Rock and a Hard Place: The image tells an inspirational story of a leopard that fell into a well in Nashik, Maharashtra, where it swam for an incredible 30 hours before being discovered alive, but barely. The cat would undoubtedly have died had it not been for local villagers, who once informed, swung instantly into action by alerting and pitched in to help forest officials. Using the remarkable ingenuity for which rustic people in India are renowned and at great risk to life and limb, villagers and officials worked in unison against all odds to save the leopard. An Ephemeral Masterpiece: On Chivla beach in Malwan, Maharashtra, a starfish collaborates with pea crabs and sea shells to create a fleeting masterpiece that will soon be washed away by the tide. The delicate whorls and loops traced in the sand by the scuttling crabs emphasise the firmer movement of the starfish whose body imprints deeply but momentarily on the beach. These gentle, placid delights of being outdoors weren’t lost on Abhishek Nandkishor Neelam Satam, who found these artists at work while on a survey for the National Institute of Oceanography. Epomis Modus Operandi: Lure your victim by appearing helpless. Attack the throat with your curved, hook-like mandibles. Clamp down and begin your feast. This is the modus operandi of the larvae of ground beetles of the genus Epomis that predate exclusively on amphibians. And this chilling image is believed to be only the second record of Epomis predation on an amphibian in India. That the amphibian in question is the endemic and critically-endangered Amboli bush frog demands further study to understand the impact that these unassuming predators are having on frog populations in the Western Ghats. The dilated eye of the dying frog and the larvae obscenely hanging out of its throat make this crisp image eye-catching, but it is the questions that it prompts, that make it exceptional. Smoke on Water: Mystic plumes of smoke seem to waft across the waters of a lake in Lalbagh, Bengaluru. But it wasn’t mists that Vishruth Cavale was witness to that October evening, it was Cattle Egrets. Those ubiquitous herons that can be seen around waterbodies across the Indian countryside and urban nature escapes. Capturing the movement of these commonplace birds along the water’s edge in a milky smear, Cavale has made an enigmatic frame. In his entry to Sanctuary Wildlife’s Photography awards, Hazra writes that this is sadly not an uncommon scene in India, "the world's stronghold for the Asian elephant." The heat from the fire scorches their delicate skin as mother and child attempt to flee the mob. In the lead, the cow’s expansive ears are angled forward as she stoicly ignores the crowd of jeering men. Behind her, her calf screams in confusion and fear as the fire licks at her feet. Flaming tar balls and crackers fly through the air to a soundtrack of human laughter and shouts. In the Bankura district of West Bengal this sort of humiliation of pachyderms is routine. Hazra said that, although India boasts 70 percent of the global population of the Asian elephant, vital elephant habitats and routes are often ravaged by human beings and the "human-elephant conflict" has escalated to a fatal degree. "The ignorance and bloodlust of mobs that attack herds for fun, is compounded by the plight of those that actually suffer damage to land, life and property by wandering elephants and the utter indifference of the central and state government to recognize the crisis that is at hand," he wrote. "For these smart, gentle, social animals who have roamed the sub-continent for centuries, hell is now and here." It remains unknown what became of the two elephants seen in the award-winning photo. Hazra's devastating image was recognized by Sanctuary, India’s leading nature and conservation portal. The organization says it aims to "communicate to readers the rationale for wildlife conservation and environmental protection with a focus on the Indian subcontinent." In the years since its inception, the group claims to have been at the fulcrum of innumerable wildlife conservation campaigns, conservation project and serves as a forum for wildlife groups, concerned individuals and non-profit organizations in the country.